An Award for Little Me? 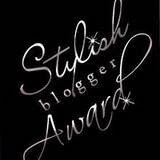 A while back, one wonderfully lovely blogger on Krafty Kat, gave me the Stylish Blogger Award *happy blush*. Wow it really has been a while... I had this wonderful project to post from a few weeks back and just havent gotten around to it yet. It seems that I am gaining followers while not posting! How amusing is that ;) I might ask the CSN people if I can do another giveaway as my 100 follower giveaway is still in the planning. Hi everyone and welcome to all my new followers :) I have actually surpassed 100 followers! *squeel* Thank you so much for following my blog and keeping interested in my busy craft endeavours (or so I hope at least hihi). I had a giveaway planned to celebrate the fact but I need to find the right thing to give away so it might take a few more days. In the mean time, do you remember this top that I bought at one of my thrifting Saturdays?